Valve’s The International Dota 2 tournament happens once a year like clockwork, and just like clockwork, it never fails to break new records. With a prize pool already 25% higher than the equivalent period last year, The International 8 is already past $6.5 million and seems poised to reach $30 million this year. For any tournament that is some serious cash, but for an e-sports tournament, that is not only mind-boggling, but is also unprecedented. Last year’s 2017 International broke the record with a $24,787,916 prize pool, though we should mention that The International has been setting (and subsequently breaking) the all-time record every year for the past five years running. As an unprofessional Dota 2 player myself, I think I am at least qualified to claim this year’s Battle Pass is bigger, and better, than last year’s with another iteration of improvements and changes made, many based on player feedback. The fabled three custom hero sets no longer involve a grinding slog through a specific list of achievements that must be completed in a specific order. Instead, simply winning a game as any one of a randomly generated 12+ heroes in the “cavern crawl”, progresses the player through an underground network much akin to a token in a plinko table, except a new hero replaces them after each point of progress and an additional hero spawns at every open fork. Battle points, custom alternative style unlocks to the sets, and if your are lucky, even a Jade Baby Roshan courier await in the caverns. 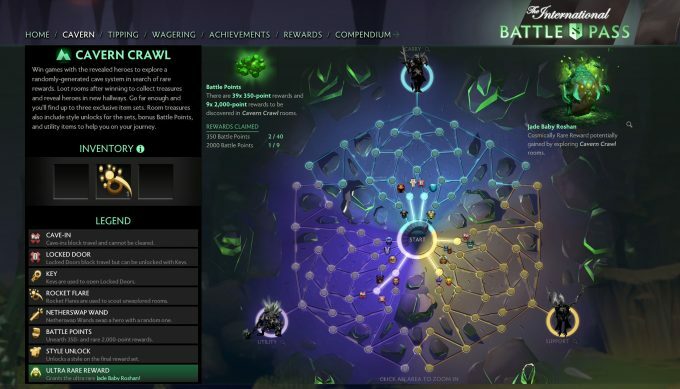 This year there are two Battle Pass only game modes added to matchmaking, the first is a ranked role-based matchmaking mode where the player pre-selects the position they wish to play (support, safelane, offlane, mid) and Dota will attempt to assemble a full team around these roles. The second is the “Mutation” game mode, where all sorts of imba tweaks are made. For example, the first day’s mutation involved overpowered runes, jungle & ancient creeps mixing it up with lane creeps, and the ability to rez fallen teammates (which seemed to result in more heroes being killed than revived, but was still a lot of fun). Nothing quite like being a level 3 support pulling the lane just to notice an Ancient Thunderhide creep and a smattering of others are in the creep mix. Other tweaks include a weekly quota of tips to hand out that no longer comes out of your personal battlepoint stockpile (so tip away!). There are new ways to earn battle points, chat wheel shouts, an upcoming Underhallow team spelunking mode, a new jade-themed terrain map, meepo announcer(s), courier, and of course the 2018 TI8 compendium itself. Players may appreciate that one of the additional ways to earn battle points are “wager tokens” that can be used to place informal bets on upcoming professional matches in both major and minor events. For example, the last major before TI8 is ESL One Birmingham 2018 which kicks off on the 23rd of this month, though there are various minors starting before and after as well. It feels like I haven’t even scratched the surface yet, so browsing to the official TI8 Battle Pass page will offer more details. (Did we mention there are so many shouts and sprays that there are now three chat wheels?) In an effort to smash more records, Valve has promised all battle pass owners will receive an additional 10 levels just for reaching $25 million this year (which is admittedly a foregone conclusion), and another 10 levels if the prize pool somehow reaches an eye-watering $30 million. For the uninitiated, 25% of all battle pass proceeds contribute directly to the prize pool, so if we remove the initial $1.6 million base, the entirety of the prize pool is funded by the Dota 2 players themselves. As usual, expect more caches, treasures, chests, drops, and events leading up to The International 8, which for the first time in TI history will kick off at Rogers Arena in Vancouver, Canada this August!